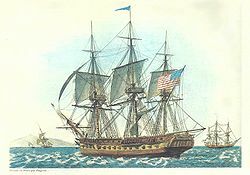 USS President, one of the six original frigates of the United States Navy, was built by Christian Bergh, East River, New York; launched 10 April 1800; and sailed from New York on her first cruise, 5 August 1800, Commodore Thomas Truxton in command. President was the flagship of Commodore Richard Dale in the Mediterranean in 1801 and 1802. She cruised in the Mediterranean in 1804 and 1805, participating in the actions against Tripoli. She cruised off the eastern coast of the United States from 1809 to 1812. She sailed from Annapolis, Maryland, 12 May 1811 and met and fired on British sloop of war HMS Little Belt, 22 guns. She sailed from New York 21 June 1812 with USS United States, USS Congress, USS Hornet, and USS Argus on a cruise in the North Atlantic. Two days later she fell in with the frigate HMS Belvidera, and after a running fight of 8 hours Belvidera escaped. Putting into Boston, she sailed again 3 October 1812 for the North Atlantic returning to Boston 31 December. She sailed from Boston 30 April 1813 on a cruise off the coast of Europe. On 23 September she captured HMS Highflyer, a schooner of 5 guns, off New York and arrived Newport, Rhode Island on 27 September 1813. She sailed from Providence 4 December on a cruise to the West Indies, returning to New York IS February 1814, and was blockaded there for almost a year by a British squadron. She sailed from New York 14 January 1815 under Captain Stephen Decatur, and the next day was captured by a British squadron consisting of the frigates Endymion, Majestic, Pomone, and Tenedos. President was taken into the Royal Navy, and as the only American heavy frigate lost to the British during the War of 1812 she was studied extensively. She was broken up at Portsmouth, England, in 1817. This page was last modified on 26 June 2016, at 22:59.